Has a luxurious feel to it, makes me feel like im in a hotel. Add a spa touch to your master bath or powder room ensemble with this essential set, featuring a sleek wood design for natural appeal. Pair the vanity-top accessories with a slender vase of faux orchids for a Zen touch, then finish it with the wastebasket and toilet brush holder to give the space a cohesive feel. Set includes one of each: Wastebasket, Toothbrush Holder, Soapdish, Lotion/Soap Dispenser, Toilet Brush with Holder and Vanity Tray. Match oak colored cabinets in bathroom perfectly! Highly pleased with purchase. 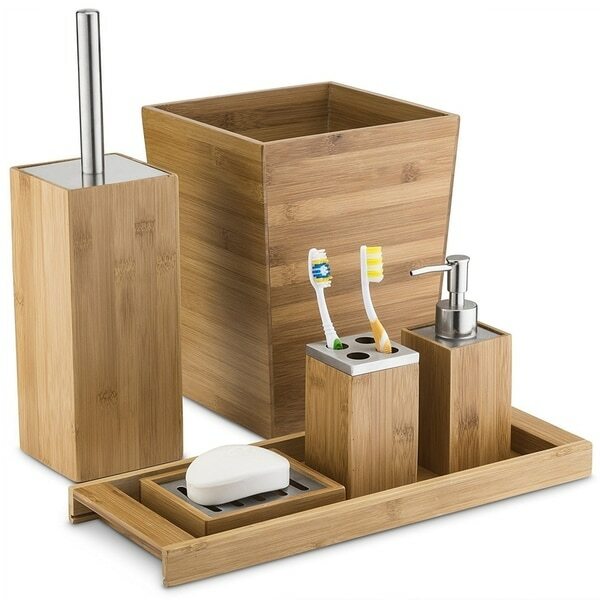 So if u are looking for a natural/ oak looking wood like accessory set then this is an item to purchase. Very pretty set. Good quality. I haven’t used the soap dispenser yet but all is good thus far! The coloring is exact to the photo above. The wood is smooth too so it looks expensive. Love this this set! It really compliments the new changes that I am making in my bathroom. I love the color and it seems to be somewhat strudy. I guess you really don't know until you put it to use! The set is not as "sturdy" as I thought. Just feels like lower quality product than what the pictures show. It looks okay, but not the highest quality/sturdy material. Just “eh”. Don’t love. A little cheaply made and cheap looking. It matched some wood accents in a new house we purchased and it appears durable and well made. The only disappointing thing is the waste basket could be a little larger.